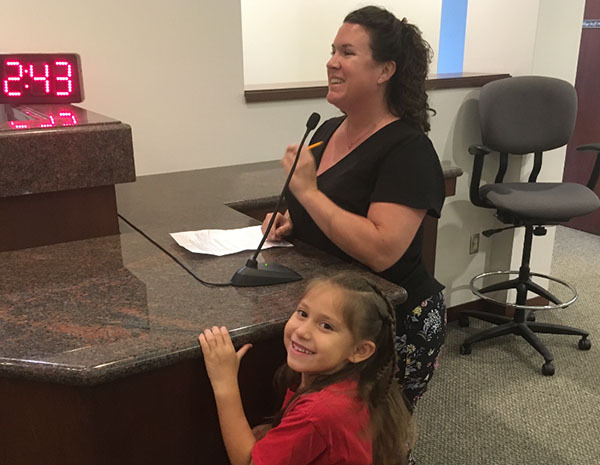 Angie Rinehart, shown with her daughter Flora, asked the Royal Palm Beach Village Council at the Thursday, April 4 meeting to reopen the early childhood learning program operated by the Parks & Recreation Department. Village officials informed her that the village is complying with new regulations requiring its licensure as a day care center, which should be complete by August. Palm Beach Sheriff Office District 9 Capt. Ulrich Naujoks presented the latest crime statistics to the Royal Palm Beach Village Council last week, which showed that the crime index in the village has fallen for the fifth consecutive year. At the Thursday, April 4 meeting, it was noted that while the village suffered an unusual two murders during the reporting period, after zero in the previous four years, robberies are at the lowest level in more than 20 years. The population of the village has almost doubled since 1998, when there were 8 reported robberies in the village, and only 9 robberies were reported last year. More good news included that home burglaries plummeted from 61 in 2017 to 24 in 2018. Vehicle theft dropped from 61 to 45 reports, and aggravated assault fell from 51 to 43 incidents. Larceny, which includes shoplifting, rose slightly from 663 incidents to 690 incidents. Incidents at the Walmart store on State Road 7, which draws customers from across the region, continues to lead the way in that category. Whether crime is on a rising trend or is falling is hugely important. It can affect how much is spent on policing and other related services, how people vote and even property values. That might explain the disconnect between the actual statistics reported and an informal survey this week on Royal Palm Beach Speaks, a social media site that boasts more than 3,000 members. In a self-selected survey, members who chose to respond, by a margin of about 10 to 1, felt crime that is actually rising in the village. Jamieson Joseph, a transplant from New York, disagrees. Counterpoint Estates resident Rhonda Dunker agreed. She also feels that society is more suspicious and pays more attention to their surroundings nowadays. “We are seeing a lot more online than we ever knew about in the past before the internet and access 24/7 to news, information and posts,” Dunker said. Dunker noted that she feels much more vulnerable to crime in Royal Palm Beach than she did when living in Wyoming. So, comparing crime in Royal Palm Beach to other areas may not be an exact science, but comparing it to itself over time may be more meaningful, thinks Village Manager Ray Liggins, who applauded the findings in the PBSO’s semi-annual report. “Going from an index of 863 in 2017 to 820 in 2018 means that the village is going in the right direction,” Liggins said. Liggins did compare the village to other cities in the state. “To put this data in context, this report places Royal Palm Beach in the safest 90th percentile of municipalities in Florida,” he said. Many home buyers use crime statistics to help decide the safest place to buy a home and raise a family. Software engineer Nathaniel Wood did lots of homework before buying recently in Royal Palm Beach’s Bella Sera community. He said his research about crime rates in Royal Palm surprised him. Wood went on to say that he really does think that crime is a problem that everyone is responsible for helping to reduce, but that sensationalizing it on social media creates emotionally charged reactions and decisions. “These reactions should really be data driven, and when you look at the data, it tells a story of total crime increase, but our population has grown as well. All things considered, RPB is a safe community to live in,” he said. The full report is available on the home page of the village’s web site at www.royalpalmbeach.com.